The city of Riverside is located 55 miles east of Los Angeles. It is the county seat of the Riverside County. It is the largest city of the Inland Empire, which composes of the Riverside-San Bernardino-Ontario metropolitan area of Southern California. 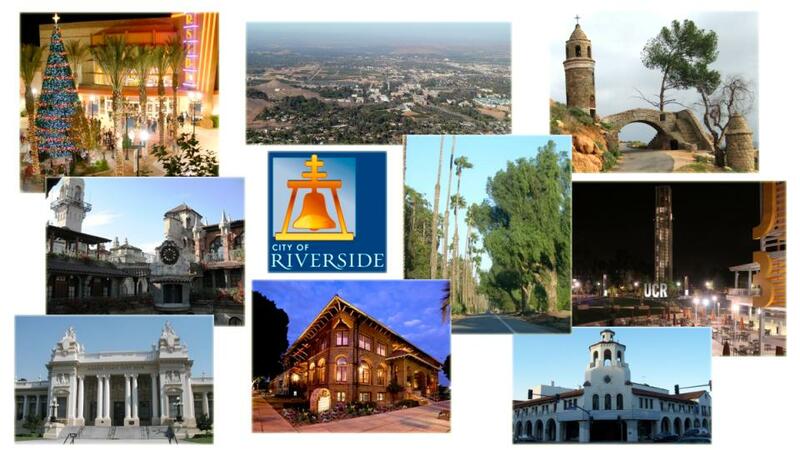 Riverside is the 61st most populous city in the United States and 12th most populous city in the state of California. As of the 2010 Census, city of Riverside had a population of 303,871. The city has a size of approximately 81 square miles. The City is the seat of the 2nd fastest growing county in the nation and leads the region known as the Inland Empire in virtually every measure of economic power. Riverside's location positions itself as one of Southern California's major transportation hubs. The City is located conveniently at the intersection of Interstate 215, the Riverside 91 Freeway and 60 Freeways. Riverside is home to four nationally recognized higher education institutions, supporting a student population of 50,000. As the home of several exciting events such as The Riverside Festival of Lights, Smithsonian Week and Mariachi Festival, Riverside is the perfect place to live, learn, work and play. Riverside was founded in the early 1870s beside the Santa Ana River by John W. North. It is the birthplace of the California citrus industry as well as home of the Mission Inn, the largest Mission Revival Style building in the United States. The city of Riverside is treasured as the home of many historical landmarks registered to the National Register Information System by the US Department of the Interior. As one of the recipients of the Top Seven Intelligent Communities of the Year (2011), Riverside provides a role model for the world's best practices in creating competitive local economies and vibrant societies in today's hyper-competitive global economy, which broadband communications is increasingly linking into a dynamic world. One of the many contributions from the city for this award is the innovative implementation of the Riverside Renaissance, which is a $1.57 billion investment in the city's future. Along side is the SmartRiverside initiative that brought the latest technology into the current and future development of the city. One of the International Sister Cities is Jiangmen, China - A city of 3.8 million in the Pearl River region of South China, Jiangmen is a city of industry and manufacturing. Riverside's relationship with the city began in 1997. Currently, the city is exploring increasing trade relations with Jiangman, and frequently meets with Jiangmen city officials to realize this goal.